A modern and cosy hotel in the centre of Jyväskylä, next to the railway station. All of the city’s services are within easy access. Refurbished rooms, comfortable restaurant, and relaxation suite with sauna and swimming pool guarantee a relaxing visit. Our hotel, located in the centre of Jyväskylä, is a cosy and comfortable place to relax and enjoy the city atmosphere. Due to its convenient location, the hotel serves as an excellent base for both leisure travellers and conference and business travellers. There’s plenty of parking space. Modern, recently refurbished rooms and friendly service guarantee a comfortable stay. Our popular restaurant offers a breakfast buffet and a delicious dinner. We serve breakfast on weekdays starting at 06:00. Relax with a drink and the daily papers in our cosy bar. After a long day, you can have a relaxing break in the sauna and swimming pool. Feel energised after exercising in the spacious gym. 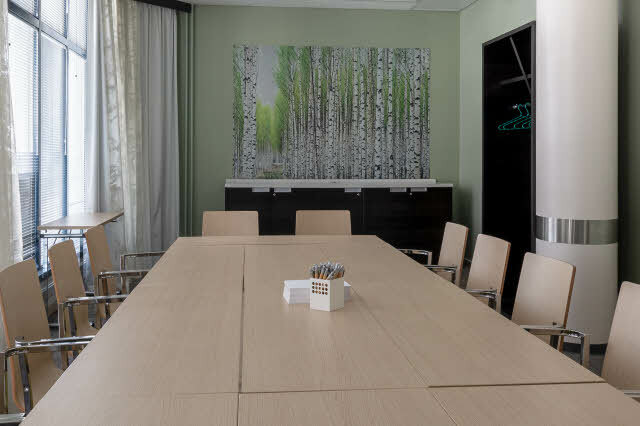 Our modern conference facilities are perfect for organising conferences and events. All areas of our hotel have free WiFi. It’s easy to arrive at and leave from the hotel, as it’s located in the centre of Jyväskylä, close to good transport connections. The railway station and bus station at Jyväskylä Travel Centre are only 50 metres away. The extensive services of the popular pedestrian shopping street are around the corner. From the hotel, it’s easy to explore the nature of Central Finland with its ridges and lakes. Popular summertime cruises also depart from the vicinity of the hotel. Enjoy a breakfast buffet and delicious flavours at dinner in our hotel restaurant. Also stop by for a drink in our cosy bar. It's difficult not to feel welcome. Organise effective meetings, conferences and events for up to 80 people in our bright and versatile meeting rooms.